Here's a scan and crop of my latest x-ray. What you won't see in it is the actual fracture. For some reason the scanner doesn't want to see the break either. Where I can see it plain as day on the X-ray film is in the lower center (inside the circle). It's actually more visible on this film from 11/20 than it was on the films from a month earlier! My doc was surprised as well. We both thought that I would be back in matching shoes this week. He pushed and prodded the fracture with very little pain sensation. I walked to the X-ray tech without extra support. All seemed well, right up to the point of looking at the X-ray! 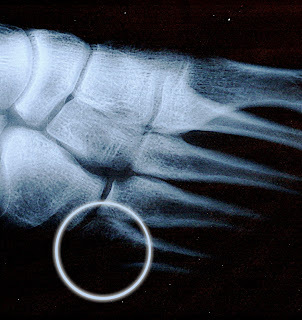 Next week I'm going to see an Orthopedic Foot & Ankle specialist for another opinion on the fracture and healing process. After 7 weeks, I'm officially tired of casts, crutches, ankle braces and sitting around. My goals include not banging my foot on anything, keeping my leg elevated for significant portions of each day, finding books and activities that do not include a remote, and eating less and less due to my lack of calorie burning from this sedentary lifestyle. If anyone reading has insight into bone healing, I'm all ears! I heard that Hyperbaric Oxygen therapy can be very beneficial for healing breaks. Since I have access to several hBOT chambers, I'm going to put in a few sessions there too. I also need some help fabricating a believable story for how I broke my foot. It's been almost 7 weeks now, and I still have the "I was clumsy..." lead that is just embarrassing!